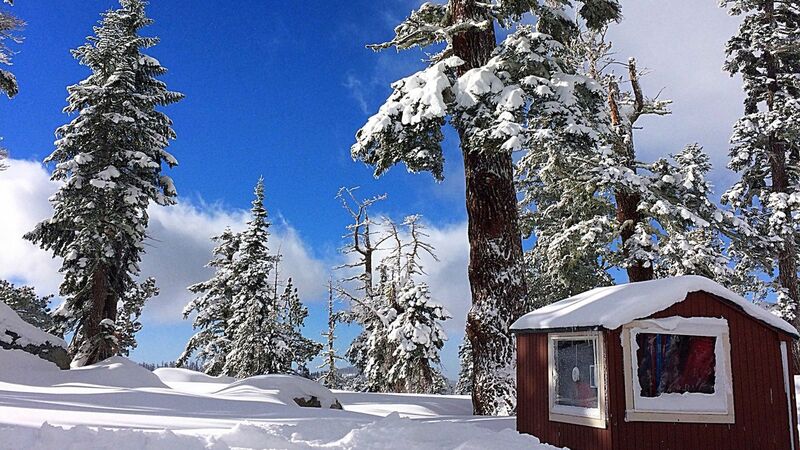 I got used to hearing “Is there even any snow there?” as I planned my ski trip to Lake Tahoe last year. A pessimistic refrain that was clearly inspired by the previous year’s snowfall, a metric that local’s said couldn’t get worse. Many Lake Tahoe ski resorts—Homewood is one example—closed well before the end of the average ski season during the winter of 2014-2015 due to lack of snow, while other local operators like some snowmobile companies, never opened at all. Fast-forward to this ski season, and most Lake Tahoe resorts opened days, and in some cases, weeks before they’re typical start date. Sierra-at-Tahoe, for example, followed one of its earliest ski season closures with its earliest opening day in a decade. Terrain that hadn’t been skiable in several years because of low coverage was all of a sudden in-play, and skiable much earlier in the year. “I was skiing areas over the holidays that usually aren't open until February because Lake Tahoe has received so much snow,” said South Lake Tahoe local and 2014 Winter Olympic half-pipe ski gold medalist, Maddie Bowman. As of the first official week of winter, many of Lake Tahoe’s ski resorts had surpassed or were nearing surpassing their snowfall totals of all of last year. Heavenly had a snowpack that was more than 160% of average for this time, while Kirkwood, further south, was at 170%. Meanwhile, on the north side of the lake, ski resorts like Squaw Valley have seen some form of accumulation nearly every day since opening, and Squaw and Northstar, among others, have seen more than 200 inches of snowfall. The message for travelers is simple: Don’t wait until spring to ski. The high snowfall and above-average snowpack has produced terrain and conditions you often don’t see until later in winter, as Maddie Bowman alluded to. The great ski conditions have largely been attributed to El Niño, a weather pattern in which the warming of Eastern equatorial Pacific Ocean waters can produce storms that bring above average precipitation. This isn’t always the case, but according to NASA’s Jet Propulsion Laboratory, El Niño brought double the snowpack in the Sierras in 1983 and 1998. Perhaps even more interesting is that El Niño in California is often strongest in the coldest winter months, though Lake Tahoe has seen a majority of its snowfall in late fall and the first couple weeks of winter. That means that this could be just the beginning of optimal ski conditions both in the area, and more generally throughout California and other parts of the Western United States. While past years may have required carefully planning your Lake Tahoe ski vacation based on which mountain had gotten the most recent snow, this year sees optimal conditions throughout Lake Tahoe’s ski resorts. According to Kevin Cooper, Senior Communications Manager for Heavenly and Kirkwood, it sets up the rest of the winter, and could potentially even extend the winter ski season if the trend of weekly snowstorms continues through the colder winter months. Even with this year’s snowfall, however, weather conditions, such as strong winds, will affect lift and gondola schedules. When that’s the case, Smaine recommends Sierra-at-Tahoe in South Lake Tahoe and Sugar Bowl or Northstar in North Lake Tahoe, which are more protected from the wind. This year’s early winter conditions benefit non-skiers, too. Many winter outdoor operators have already opened up when they didn’t open the last couple years because of the lack of snow. This includes Zephyr Cove’s snowmobile operations, which has been doing daily lake-view snowmobile tours of Lake Tahoe since December. Additionally, this year’s snowfall (and predicted snowfall) affects road conditions like it hasn’t the last few years in Lake Tahoe. If you’re driving around Lake Tahoe, especially on secondary roads, you’ll need chains on your car if you don’t have four-wheel drive. Consider this especially when renting a car and when choosing on flying in and out of Reno or San Francisco, since snowstorms will significantly affect your travel time. For Lake Tahoe, however, this is a welcome downside to what’s been an upside winter.